After being disappointed when they couldn’t find anywhere to buy a healthy salad after their daily workouts, cousins Marielys Quezada and Angi Tejada decided to create a place themselves. Their eatery Freshly Made Sobro, located on 2535 Third Avenue, opened in March and serves everything from garden-fresh squeezed kale with a touch of pineapple and apples to vegan wraps at prices from five dollars to eight dollars. 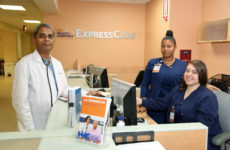 Quezada and Tejada, who are both Bronx natives, believe making healthy options accessible in a low-income community can impact the way people learn and understand the benefits of fruits and vegetables. By working with local community groups such as The Bronx Box Cross Fit Gym, Quezada and Tejada have been able to provide informative workshops on the importance of healthy eating habits. “The core of us being here is to give people the freedom to create their own juices but to also be a guide in promoting awareness on being health conscious,” said Tejada. 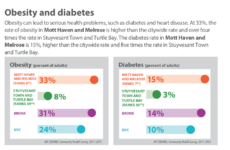 A third of Mott Haven and Melrose residents suffer from obesity and 15 percent suffer from diabetes, according to a 2015 survey released by the New York City Department of Mental Health and Hygiene. Adults in the area are less likely to consume fruits and vegetables and exercise per day than adults anywhere else in the city, according to the report. Despite health disparities in the community, initiatives like Freshly Made Sobro strive to promote healthy eating habits at an affordable price. 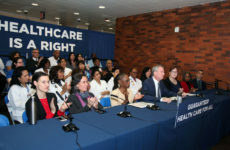 Dr. Sean Lucan, an associate professor at Albert Einstein College of Medicine who has studied the food environment in the Bronx, states that shaping the language of food and providing community efforts to combat highly processed and convenient foods will ultimately change the attitude of eating habits in the neighborhood. “There needs to be local places that offer fresh foods. Working with owners by offering fresh food can help make it appealing to customers and ultimately change the attitude towards healthy meals.” he said. “Being able to come here has helped me learn how to reduce my calorie intake by giving me the tips I need to eat smaller portions,” said frequent customer Jhanmarie Ortiz. 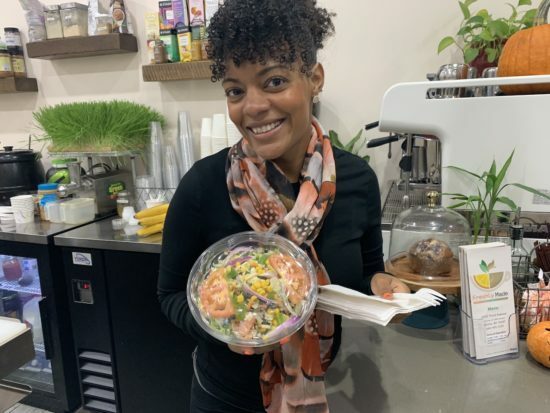 The café, which serves recipes like the Four-O juice, which is dedicated to the 40th precinct and their 138th street salad, are all priced for less than $10 each. The 33-year-old businesswomen who work part time, along with managing Freshly Made, say they buy all their own ingredients at the Hunts Point Produce Market and work at the shop with their family members to keep costs low. They add that they also conduct research regarding quality to ensure premium ingredients at a reasonable price. “This allows us to offer things at a cheaper price such as monthly specials to avoid overcharging our customers,” said Quezada. Calvin Davis, 48, who has lived in Mott Haven for 19 years and has a history of diabetes, said Freshly Made Sobro is a welcome healthy food haven in a sea of fast food restaurants.